A bit of a messy post here folks. I'm writing this on Monday afternoon, ready to post on Tuesday, and I'm at home. I'm not feeling well and decided that I already give enough to my day job, they don't need me spreading germs and collapsing at my desk! I thought I'd show you a few projects/bits of projects I've done recently that don't really deserve a blog post of their own. Oh dear, now I feel bad for them! Another square of the alphabet chart I've been working on for almost a year now! I HAVE to get this finished or the little lady it's intended for will already be able to read and write before she gets it! I used my fab Big Shot and a Sizzix jigsaw die for this one. 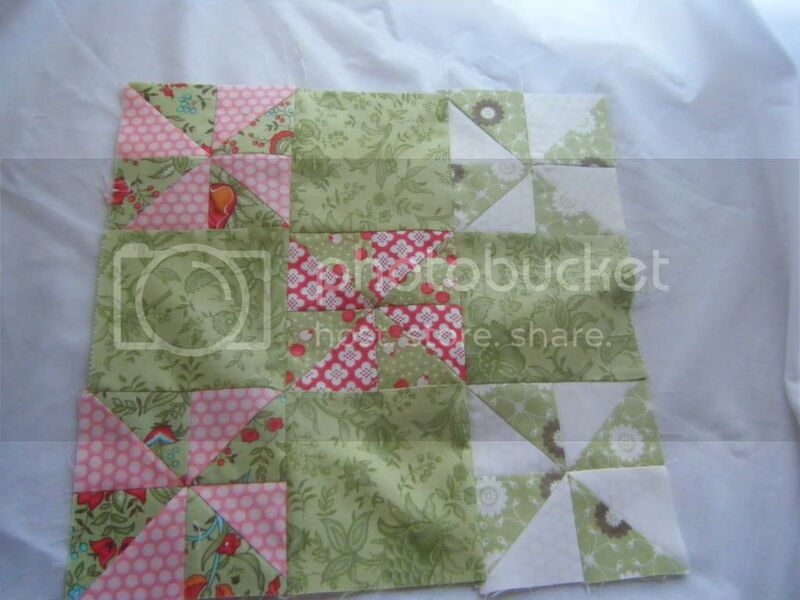 I know the Accuquilt Go has been much touted around blog land recently, but there are alternatives. I've had my Big Shot for years and recently discovered it could cut fabric.... bonus! 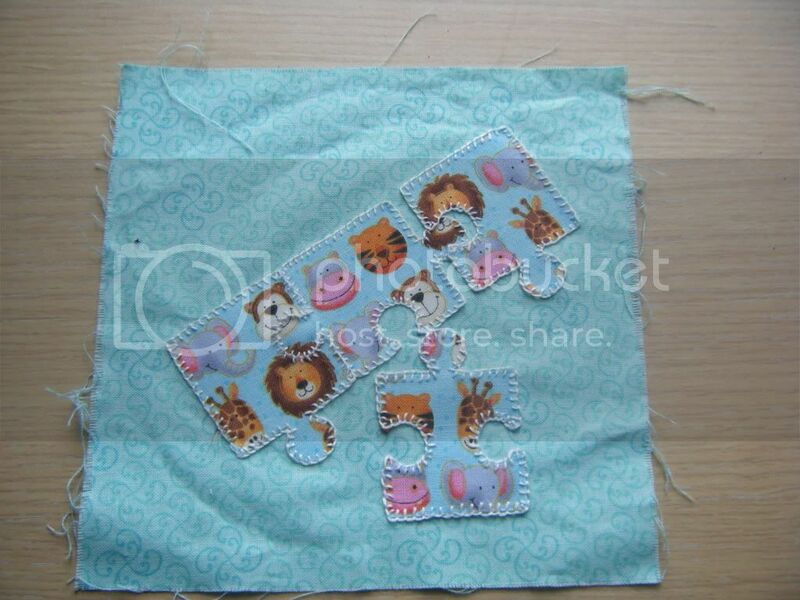 I used a cute animal print and just blanket stitched around the pieces. It's a bit of a shame that I didn't have my sewing machine when I started this as machine applique would be so much quicker and I'd probably be nearly finished by now. I can't really carry on and do machine applique from now though as A-M are all hand appliqued. 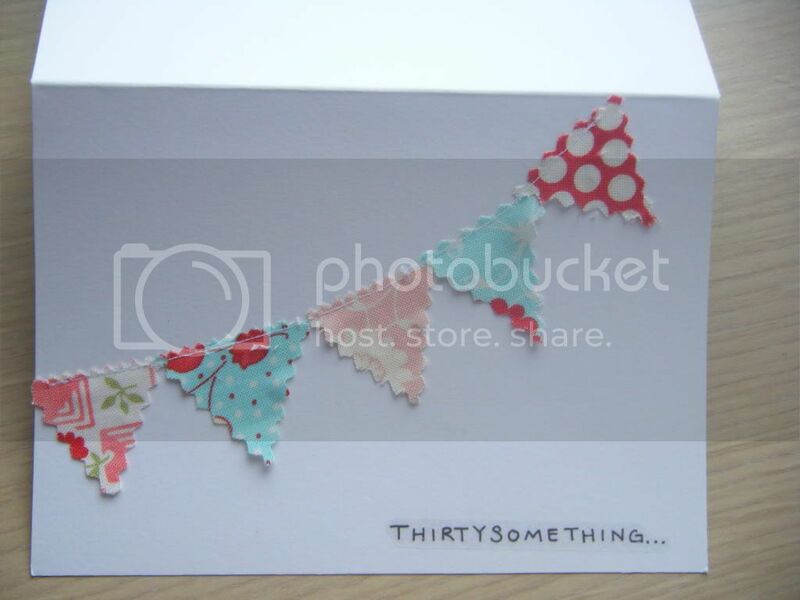 A birthday card for a friend, shamelessly copied from the dozens of bunting cards / pouches / cushions I've seen around blog land. 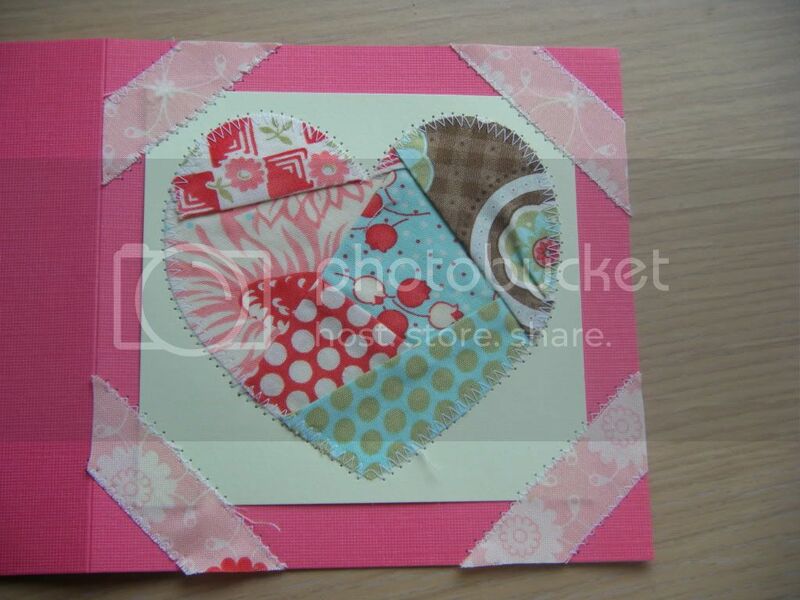 And a scrappy sewn heart card. The heart was also cut using my Big Shot. I can't remember for the life of me now who I gave this card to! I finally got round to doing last week's Skill Builder Sampler Quilt block, I'm a week behind as this is block 4 and block 5 was put up on Friday. I couldn't be bothered to do this before as it was so like my bonus block, but I girdered my loins and got on with it. I really don't know what girdering your loins involves. I don't think I've EVER said that before! 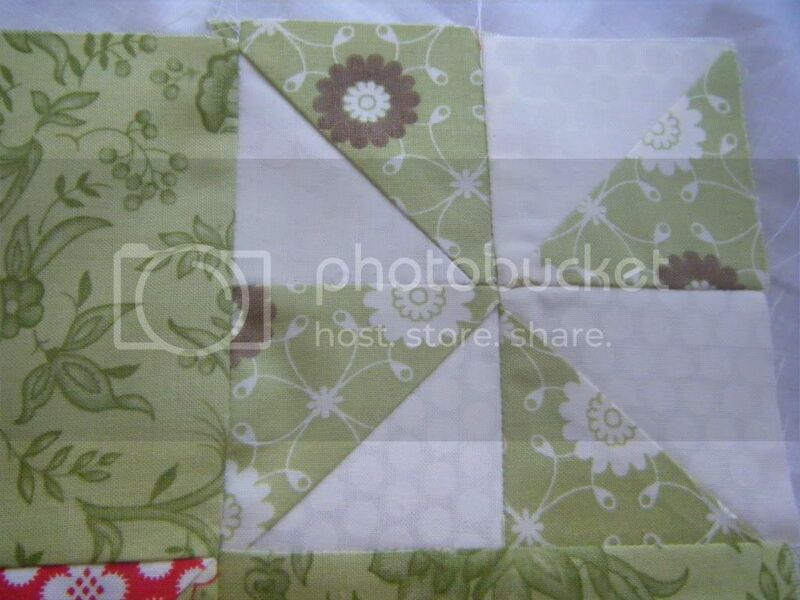 Again, I used Bliss as I have a project in mind that needs a few quilt blocks. 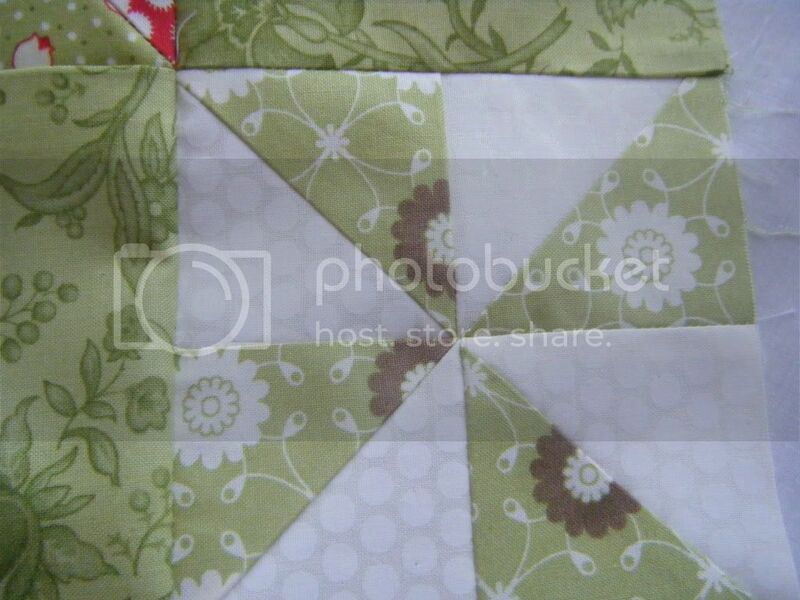 I ignored the tutorial where it called for white squares and HSTs and did it all in patterned fabrics. Some were more successful than others. Really, really, really not perfect or even near perfect or even decent points. I need to get on and make the next one but I'm lacking enthusiasm at the moment. I'm not sure why, it might be because I'm under the weather or it might be the length of time it takes to make each block - a couple of hours! Right, I'm off now to finish watching Sunday's Eastenders omnibus and do some more tapestry, followed by a bit of giant granny squaring I think. Mr CA has been dispatched to the supermarket after he finishes work and I may just lie on the sofa and let him unpack the shopping and make me some tea! Sorry to hear you're under the weather girl, I hope you're feeling better fast and that you got that cup of tea....your projects are adorable [love that banner card] and wow you got perfect points. I think that's like a hole in one, in golf. Not that I golf. But if I did, it would be just as unattainable. You are an utterly prolific crafter aren't ya?!! I love everything you have showed us on this post. Awwwwww sorry you weren't feeling well yesterday - I hope you're better now!